This paper is based on the Academic Research of Dr. Myles Sweeney and the authors experience in the deployment of collaboration software to improve business performance in both Small, Medium and Large Enterprises. 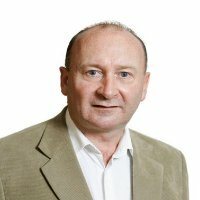 Declan Kavanagh has over 36 years’ experience in the technology sector working in Ireland & Internationally, starting his career as an electronics engineer in the multinational (MNC) sector, he has held technical and leadership positions up to and including CEO level in SME’s and MNC’s in the hardware, software and services sectors. His experience also includes the set-up, scaling and sale of a successful ICT services company to Cap Gemini. Declan also has two mobile enabled SaaS products nearing completion of development and market launch. Declan holds DipEng from Dublin Institute of Technology, CDipAF from the ACCA, MBA from Dublin City University, and OU MBA certification in Professional services management. Declan is author of best seller “Advantage” (A guide for entrepreneurs and leaders in the Digital Age) and many conference papers on business and technology. 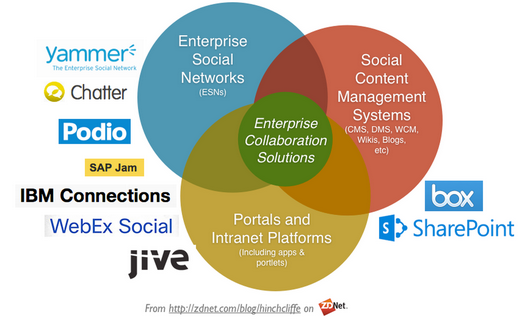 What we have learned about enterprise collaboration in the Digital Age? The key findings from our research and from practice is that to achieve the target business benefits of collaboration technology we must view the change as an organisation development activity enabled by technology, rather than what many have viewed as just another IT project. What this paper does is provide some suggestions and tried and tested techniques that increase the success of organisations in engaging employees who positively impact performance through leveraging technology and changing their behaviours. Collaboration is fundamentally an interpersonal activity and can be observed not only by results but by behaviours, processes, leadership and culture. There are many known and accepted benefits of collaboration. However, fundamentally organisations adopt and promote a collaboration culture to improve their performance and stakeholder satisfaction. They do this by enhancing the communications, teamwork and employee engagement in the strategic and day to day business of the organisation at an organic level. Management provide leadership, example, support and tools to staff that empower staff to take ownership of their outputs and those of the teams through Collaboration, rather than through command and control, rules, policies and more formal structured practices. – Ref. 2009 “Collaboration in the Cloud” by Sogeti & Microsoft. can release talent (removing barriers to participation and engagement). What are the challenges with collaboration? Organisations fail to recognise that collaboration is about human behaviours in the system. New software applications alone will not change inherent behaviours. Organisations fail to prepare an adequate business case and then track the business benefits for their collaboration program. Managers fail to recognise and facilitate the fundamental changes in how an organisation works as a result of releasing talent through collaboration. Choosing the right technology and deployment at the right time requires business, organisation development and technology skills to be embedded in the selection process. Organisations manage as IT projects rather than OD projects. Interventions not aligned with organisation maturity. What do we mean by interventions not aligned with organisation maturity? Essentially what we mean is that management and leadership implement a program of actions relating to introducing collaboration enabled by a software tool or platform that are beyond the capability of individuals and teams to absorb at that point in time. Or in layman’s terms “If the organisation legacy culture is a rigid formal, rules based command and control as an extreme example (mechanistic) and the collaboration goal is to achieve a more organic organisation (Burns & Stalker), dropping in a new collaboration tool/platform will not change this significantly”. In fact the wrong level of intervention can have a negative effect. 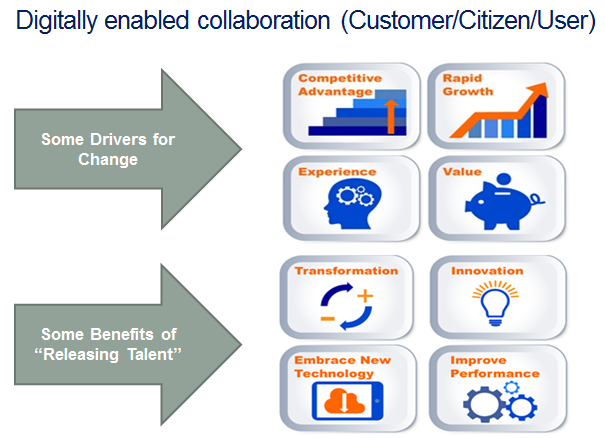 By looking at the collaboration program as an OD initiative the leadership are more likely to put in place a holistic program which includes Personal Development, Organisation Development and Technology Implementation where the timing, synchronisation and calibration of each intervention type is such that the culture change leads to greater Return on Investment and improved business benefit from the total investment in improving employee communications, engagement and collaboration. Pre-dispositioned to collaborate, for collaboration to occur you need two or more people to be pre disposed to collaborate. The types of feelings and behaviours that those pre-disposed to collaborate are as follows “I cannot do it on my own!”, “It would be better to do it with person B, because…”, “It would be more enjoyable and productive to do it with…”, “I would get a better outcome if I consulted person C because person C…”. Desire to seek, for collaboration to occur two or more people share a common desire to seek “a common goal”, “a common interest”, “like-minded individual” or “newness”. Social, for collaboration to occur two or more people may seek to collaborate at some level based on having a personal need that is driven by “collegiate needs”, “friendship”, “security”, “interaction”, “stimulation and reaction”. Style, for collaboration two or more people will have synergistic personal behaviour styles such as “communications”, “idea and idea generation”, “building & challenging”, “testing”. So some or all of the above traits come together to enable two or more individuals to successfully collaborate both tactically or strategically, short or long term. In an organisation if the majority of employees and stakeholders share these traits it is as an organisation likely to be more organic and culturally mature as it relates to engagement, communications and collaboration. 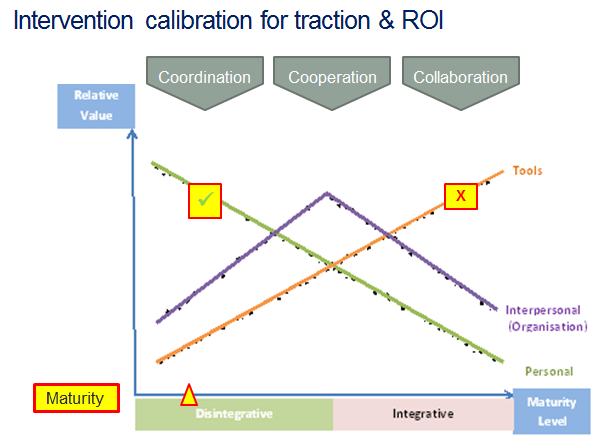 That said if the traits of the 4 key areas above are the inverse or opposite then collaboration barriers exist and these need to be removed to enable the creation of a collaborative culture and the adoption and ROI from investment in collaboration tools and platforms. What influences people to collaborate or not? What management and leadership in an organisation normally desire to achieve is high performance , as measured by benchmark industry performance, and/or target performance outcomes as set by the key stakeholders in the organisation. There can be many types of outcomes for many organisation types, we often defer to what we believe most commercial organisations expect which is growth in financial performance, “revenues, profit, cash”, however there can be many indicator types “customers, service levels, satisfaction, social benefits etc.”. How do organisations learn and learn to collaborate? Argris & Schon (1978) looks at expected outcomes versus actual caused by action and also influences on action culture etc. Kim (1993) looks at information flows. Nonaka & Takeuchi (1995) looks at tacit (personal, context, subjective) and explicit (formal, systematic) knowledge. Bontis & Serenko (2009) look at Managerial Leadership & Employee sentiment as Key. Someone we believe tells/instructs us (guru, mentor, leader or trainer). Individuals learn the same thing together and practice. Individuals, groups, organisation have a positive or negative experience and take action as appropriate. There is a program of organisation learning as part of our strategy ,vision, plan, needs analysis, interventions, phases etc. We institutionalise the good learning through policies, procedures, training, systems etc. 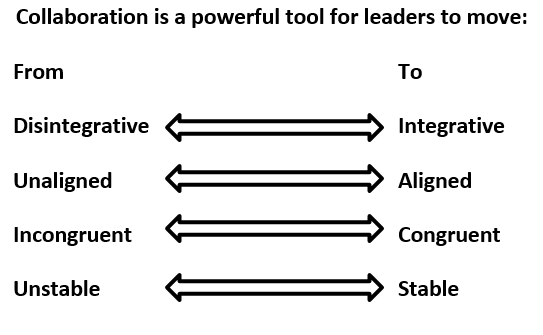 There are 7 phases of human-system learning (Dr. Myles Sweeney, 2010), and the Holignment Organisation Maturity Index provides a normative method of measuring the level of learning (maturity) for any organisation or for that matter system. Pitching interventions beyond the learning level of the organization means no traction, and leads to 50% failure rates in O-D and growth strategies. Interventions should be pitched at an org’s learning level, or relevant learning should be raised accordingly. Phased learning means sustainable growth, integrated interventions, and no catastrophic loss of performance. Application of Dr. Sweeney’s research in organisations has demonstrated the truism of the above three points. 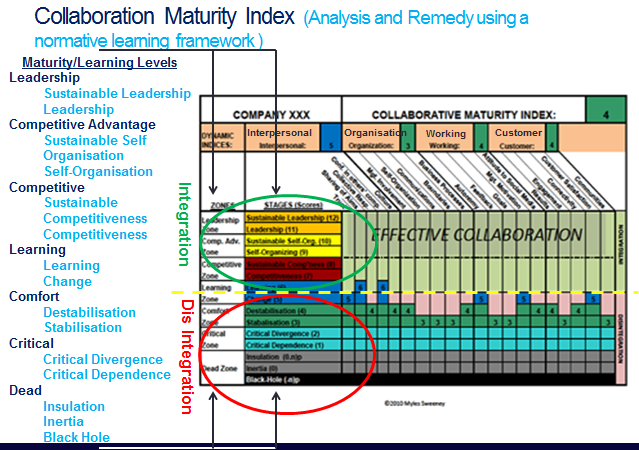 In particular, as a case example, the author along with Dr. Sweeney applied the HOMI assessment and maturity model for collaboration to understand why in an advanced multinational organisation the roll out of IBM’s social connections platform as part of their collaboration program failed to achieve both the momentum, outcomes and ROI that was initially expected in one of its divisions. Following the HOMI assessment , management were able to identify that though the organisation viewed itself as an advanced digital organisation which was reasonably successful, that implementing the platform roll out largely as an IT change project failed to recognise and account for the personal development and organisational development interventions that would enable employees more deeply engage in the adoption and leverage of the new technology. So why use a framework? 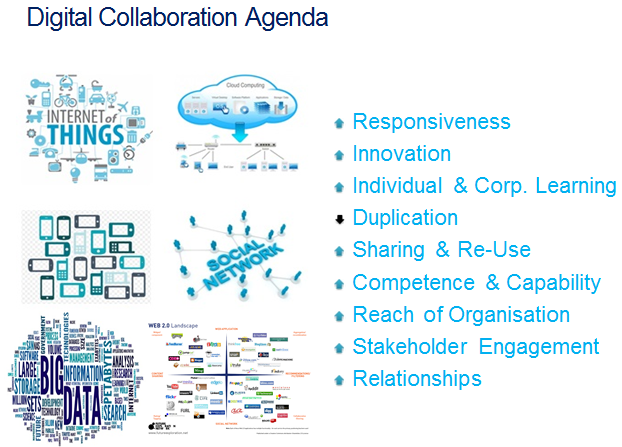 Be informed on the organisations current collaboration maturity. Select and implement those interventions/actions that will enable the maximum traction for the investment ensuring those interventions are at the correct level to move the collaboration maturity towards the highest performance level. Identify timing and selection of the most appropriate technologies and related functionality that will support the organisation moving through the maturity levels for collaboration. A Framework example “The Collaboration Advantage™ Framework” ©Strategic Business and IT Services Ltd.
attitude to propriety or open source solutions. Larger organisations are more likely to benefit from enterprise class collaboration platforms such as IBM’s Social Connections and related social tools, or Microsoft Office 365 tools. For SME/SMC’s there are many choices, but you will not go too far wrong by trying out WISP from CactusSoft. This simple, low-cost Application is free for up to 9 users and for a modest monthly fee can be used for 9+ users. It has a robust set of integrated features and is very easy to adopt and roll out to staff anywhere and anytime on IOS and Android devices. The organisation and employees can share news, policies, information and collaborate no matter where they are located. Recognition that the people are central to adoption. Interventions are at the right learning level to get early impact. A business case and value can be tracked. Faster adoption and output from technology. Accelerate innovation, productivity, knowledge sharing & information management. Improved employee engagement and satisfaction.